I want to share with you a new blog I recently found called KitchenPlay. Each month they host a “Progressive Party” where they ask 6 people to create recipes based on a different ingredient and then invite other bloggers to recreate one of the recipes for a chance to win. This month’s sponsored ingredient is Dreamfields Pasta. Always up for a challenge and being a huge pasta fan how could I not take part in this month’s Progressive Party. First let’s talk about Dreamfields Pasta. I’ve seen this pasta in the supermarket; but never really gave it much thought. I’ve had bad experiences with various pasta’s not tasting good or not cooking up right. So I tend to stick with brands I’ve used before. I’ll admit I was pleasantly surprised with Dreamfields; the pasta was delicious. Even my husband, who is pickier than me, commented on how good the pasta was. 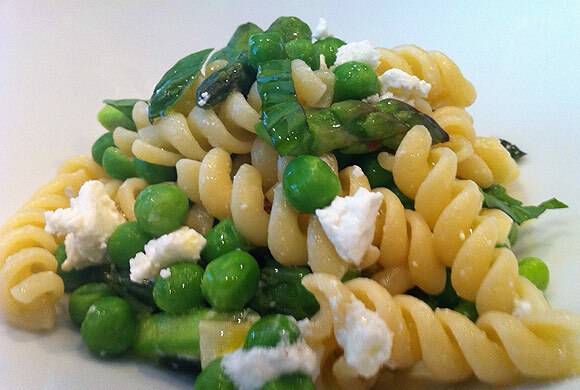 As for the recipe I choose to reinvent: Rotini with Broccoli, Peas Basil and Goat Cheese created by Winnie of Healthy Green Kitchen. Winnie’s recipe sounded fabulous but I really wanted a pasta dish that would utilize ingredients both my husband and I enjoy. So I tweaked it just a little and came up with my own version. Cook pasta according to manufacturer's directions. Heat the olive oil in a skillet over medium heat. Add garlic, basil and crushed red pepper to the cold oil, to avoid having the garlic brown too fast. Cook until fragrant. Add the asparagus and frozen peas to the flavored oil. Cook until veggies are tender about 3 minutes. Add the asparagus tips and season with salt. Drain pasta reserving about a cup of the liquid. Add pasta and reserved water to the pan, tossing to coat. Add goat cheese; give one last toss and serve. Top each plate with some fresh basil if desired. Pretty much obsessed with goat cheese. And peas right now - SO good! This looks amazing. I like the twist you put on the dish with just a bit of kick thrown in! Nice job! Yum!This looks amazing! Love the peas and basil! Yum! This looks so tasty! Love the flavor combinations! Spicy basil oil evens out the sweet goat cheese and asparagus. I love pasta with veggies and goat cheese. Made one with kale, sausage, and goat cheese last night for dinner. This sounds delicious! I love the spring produce! That spicy basil oil sounds right up my alley. I'm gonna have to try this! Yummy! Looks like a delicious lunch or simple meal to take to a summer party.